The allowances for African troops fighting al-Qaeda-linked militants in Somalia have not been paid for at least six months, the BBC has learned. The 22,000-strong African Union force (Amisom) fighting the Islamist militant group al-Shabab is funded by the EU. An European Union source told the BBC that last six-month payment was being withheld over “accounting issues”. The head of Amisom told the BBC the correct papers to account for the last tranche had now been submitted. “These papers are on their way; the money is also on its way,” Francisco Madeira said. The EU provides $1,028 (£700) for each Amisom soldier each month; their respective governments then deduct around $200 for administrative costs meaning the soldiers are supposed to take home about $800. This deployment allowance is much more than the meagre salaries the soldiers receive from their governments. The funds are only released to Amisom by the EU once the accounts from the previous payment are signed off. The BBC understands there have been delays over the last two tranches – and last year’s June-November payment has only just arrived. So soldiers are now receiving money owed to them last year but have not received any of it owed to them this year. Ugandan military chief General Katumba Wamala said he unable to describe the extent of his frustration over the late payments. Gen Wamala also said that Uganda would pull its soldiers out of Somalia by December 2017, because of frustrations with the Somali army and military advisers from the US, UK and Turkey. Uganda joined Amisom in 2007 and is the force’s biggest contributor, with more than 6,000 troops. Burundian military officials also said their troops had not been paid. 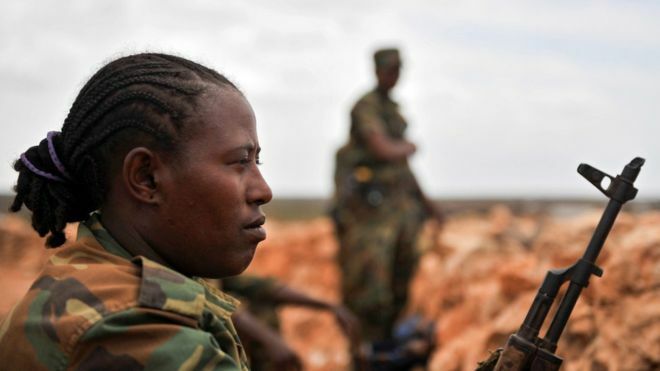 Amisom officials fear that the late payments are having a negative impact have on troop morale. EU ambassador to Somalia Michele Cervone d’Urso said he was “concerned about the delay” in the stipend which he said was “essential for the motivation of soldiers”. In the past 12 months four Amisom bases manned by Burundian, Ugandan, Kenyan and Ethiopian troops have been attacked by the militants. According to the Somali president, 180 Kenyan troops being killed in a single incident in January. Kenya has never confirmed how many soldiers it lost in the attack and African Union does not release full casualty figures. 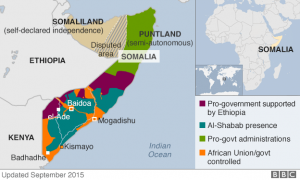 20 October: 70 Amisom and Somali troops killed in clashes in Mogadishu. Leapfrogging is only so good. Africa needs to make things. Ethiopia’s faltering dependence on China: Leading by example?